These are all the Blogs posted in May, 2013. We departed from Punta Gorda, FL on March 22, 2013 and arrived to Stamford, CT on May 12, 2013. 11 days on the hard at the Owl Creek Boatworks in Alva FL. 1 day anchored in Pelican Bay for pleasure. 7 days at the MTOA Southern Rendezvous in Fernandina Beach, FL. 3 days in Portsmouth, VA waiting for weather. 1 day in New York, NY waiting for weather. After hanging out for a day in New York we departed on the final leg of our journey north at 0645. According to my calculations this departure time would place us at the Battery about 2 hours after low tide. Arriving at this time gives you a favorable current up the east river and it continues into Long Island Sound. Initially, we had a current against us as we crossed Hudson River toward the Battery running at less than 6 knots for about a half hour… we entered the mouth of the East River and we were met with a boost of current taking to 8 knots very quickly. The farther we proceeded up the East River the faster we went… 8.5… 9.0… 9.5… 10… 10.5… at 11 knots we leveled off and maintained 11 – 11.3 until we reached Roosevelt Island and our speed increased again to 11.8 knots… we passed through Hell Gate where the East River and the Harlem River meet… the East River has sort of an S-curve in it just at this point and through this curve exceeded 12 knots… our speed through the water was 7 knots… we were getting a 5+ knot boost of current. It was awesome!!! After this the East River widens up and the current slows down but we were still doing 8.5 to 9.0 knots all the way to Long Island Sound at the Throgs Neck Bridge where we slowed to 7.5 to 8 knots. We rode at this speed to just past Execution Rocks where we slowed to 7.3 – 7.5 knots which we maintained for the next couple of hours as we approached Stamford. 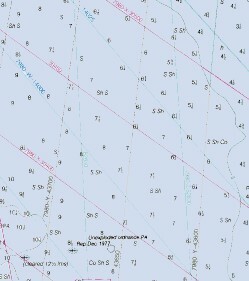 We reached Stamford at 1100 and were securely docked at the Stamford Harbor Park Marina at N41°02.490’, W073°31.858’. We traveled for 4.25 hours covering 35.4 nm averaging 8.4 knots. After a long day of cruising yesterday from Cape May to New York and the weather forecast of 90% chance of rain and thunderstorms… we decided to take a day off and stay here in New York for a day. Tomorrow is the final leg of our journey north. We will arrive to Stamford, CT tomorrow where we spend the summer and fall.